Compact cameras are simple in design. They are designed for a small, compact light weight camera body, and are good for snap shots or point and shoot photography. The design is a light proof box with lens on one end and film or a digital image sensor at the other end. Aperture ring is provided to control the amount of light reaching the film. Shutter mechanism is copal type, which is usually placed between the lens. Most of cameras are with auto focus mechanism, though few of them were offering manual focusing, which are now out dated. The picture taking lens projects the actual image on the image sensor. For pre-view of an image, a separate window is placed on top of the camera body, which is tuned with the projection of the picture taking lens. However, as this tuning is done for the object at a long distance, it does not work accurately at close distance because of parallax error. 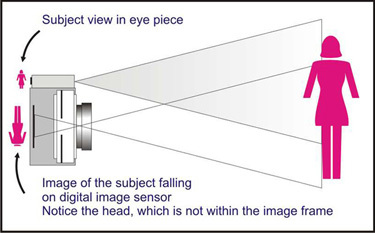 Above is the illustration of how the final photograph is cropped because of parallax, as picture taking lens and viewing lens are at a distance. Yet, this design is very simple and works well in most of applications. Simplicity in mechanics make the camera production cost low and easy to maintain or repair. However, this compact design will not allow interchangeable lens. Digital version of these cameras use a smaller size image sensor compared to DSLR cameras. However, few models are available with a larger image sensor. Check the camera manual for the size of the sensor before buying a camera. These cameras can directly be connected with a computer to down load images or you can remove the image memory card and download images through a card reader. Simple mechanism, so less expensive. Most of modern compact cameras are available with zoom lens. Check the zoom range for optical zoom. Digital zoom also is provided on some models, but that is not a true zoom. Modern compact digital cameras display preview on LCD screen. In this case, eye piece for preview is not there. This removes the problem of parallax, but preview of an image in bright sunlight is a bit difficult. However, other electronic assist like "smile detector" and "face detector" on LCD screen helps us to just point and shoot the subject.